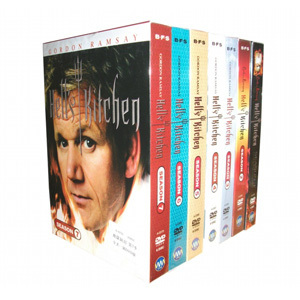 Hell's Kitchen is an American reality-television cooking competition (based on a series of the same name, broadcast in the UK) broadcast on Fox.The series describes world renowned chef Gordon Ramsay puts 12 aspiring young chefs through rigorous and devastating challenges at his restaurant in Hollywood, "Hell's Kitchen", to determine which of them will win the restaurant of their dreams. 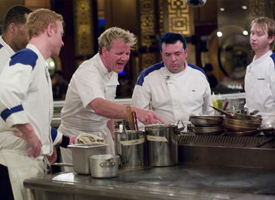 Their dreams are quickly becoming nightmares.Each episode begins with a team or individual challenge; the winning chef or team may get a reward, while the losing team or players are required to perform some form of manual labor, usually consisting of kitchen duty in preparation for the dinner service but may also be cleaning the dormitories or decorating the restaurant for a particular event. 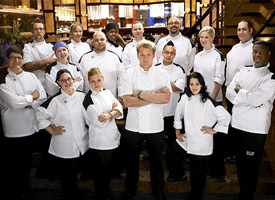 Hell's Kitchen is just simply addictive for my family and me. We cannot wait for upcoming seasons!